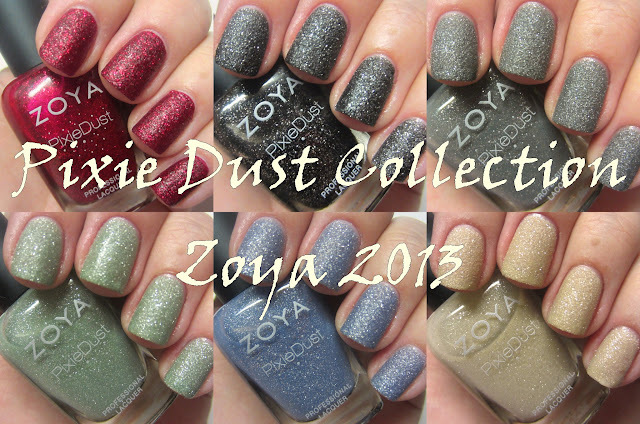 I have a very special post for you today: my swatches and review of the lovely Zoya "Pixie Dust" Collection. The newest fad in polish right now is textured polish. I did it, OPI did it, Milani did it, Barry M. did it and now Zoya is doing it too. In my opinion, textured polish is the best thing to hit natural nail polish. It is super long lasting and protects the nail like armor. Also, the few that I have tried out and the ones I make myself, are pretty much 1 coat polishes. Now, if you're like me, you use an extra coat for good measure, but it really isn't necessary. While I can't speak for the recipes that other polish makers use, you get a textured finish from a polish by using an abundance of glitter and pigment. Look at it as "concentrated nail polish". It's super! The flip side of the spoons, or what the polish would look like with gloss on top. These polishes are much more beautiful and sparkly in person than I've seen in any swatches, INCLUDING MY OWN. They really need to be seen in person to truly appreciate them. As you can see, the first three darker colors offer more coverage and were opaque in just two coats, versus the last three lighter colors. If I were purchasing these polishes, I would say the must haves of the collection are Chyna and Dahlia. They are truly one of a kind polishes with immaculate formula and they are just so pretty, sparkly, glittery that I couldn't get over them. For a brief (very brief!!!) moment after I swatched Chyna, I considered throwing away every red polish I own because I now have the prettiest red polish known to man. This is saying a lot, considering I am a red-polish-whore who avidly collects that particular color. Zoya is always having fantastic sales and deals on their polishes, so even if you aren't on the market for polish today, make sure you sign up to receive emails or like their FACEBOOK PAGE, so you are in the loop. Thank you Maili! I recommend the darker shades. Oh yes, I need these. No doubt about it! Plus - your swatches are gorgeous!!! Out of all the companies doing textures, I think Zoyas are the best I've seen. Worth owning a few.